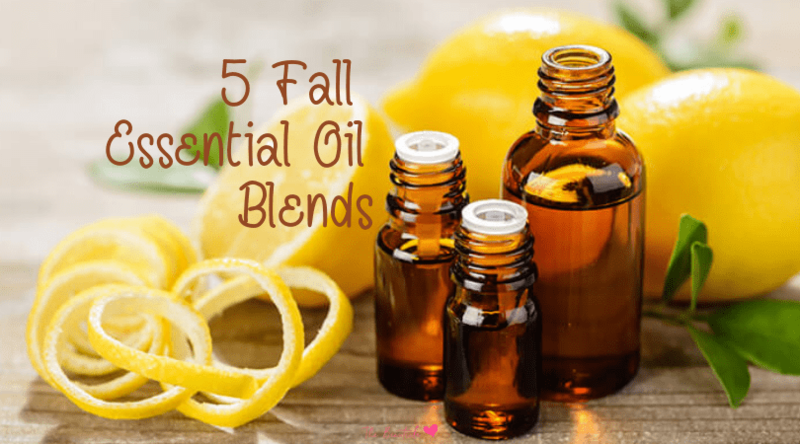 This article gives you 5 fall essential oil blends to enjoy. These Autumn diffuser blends will warm your home and infuse healing aromatherapy throughout your rooms for the holiday season. As the air gets cooler and we transition to the changing colors of Autumn, these fall essential oils will add a warming and comfortable scent to your home. 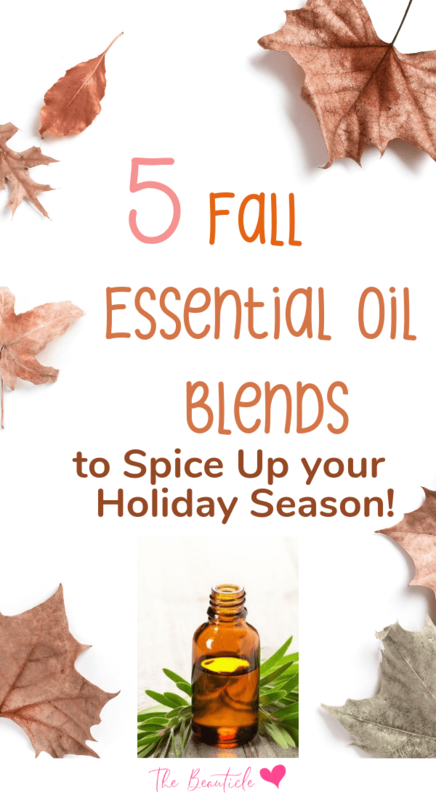 Each blend is designed with oils that heal so that you’re not only getting the goodness of fall scents but the healing effects of some of the best smelling essential oil blends. Head here to know how to choose the perfect essential oil diffuser for your home based on the room size and your preferred method of diffusing these healing oils. Enjoy this spicy orange aromatherapy blend at those times when you need warming from the outside in. This blend brings an uplift in mood, increased energy levels and an overall feeling of happiness and wellbeing. Orange essential oil is best known for its disease-fighting ability and talent for producing euphoric feelings. If you’ve ever come across a “joy blend” or “happy mix” of essential oils, it probably contains orange oil as the main ingredient. Orange oil cleanses and purifies. You’ve may already know about using orange oil to clean wood furniture, floors and more. A bonus to using this amazing, anti-bacterial, antiviral and anti-fungal natural essential oil for cleaning is that you get to sniff up the delicious, uplifting aroma of oranges while removing dirt and conditioning the wood items in your home. Orange oil is said to be anti-depressive due to its invigorating effect on brain function. This oil is not quite as stimulating as other oils, such as peppermint or rosemary, either of which may cause excitability in individuals prone to such changes in mood or temperament. Orange essential oil is more balancing, known to alleviate anxiety while simultaneously improving mood. This makes it a sought-after aromatherapy choice for people with both anxiety and depression. Another benefit of orange essential oil is its anti-inflammatory effects. Inflammation is the body’s natural response to an irritant, which could be illness, allergy, sensitivity, or injury. Redness, pain and swelling indicate that the immune system has sent white blood cells to the site of irritation. Diffusing orange oil can help the immune system balance itself to help your body return to a healthy, rested state. Orange oil comes from the peels of an orange, and its aroma can seem overly sharp or sweet to some. This oil balances nicely with warming cinnamon or nutmeg, in the same way that you might enjoy sipping an orange spice tea to wind down after a busy and hectic day. Like the other warming spices, ginger, nutmeg and cinnamon, clove essential oil has stimulating properties. You might call this essential oil another “giver of life” due to its especially powerful anti-carcinogenic profile and ability to rid the body of free radicals. Compounds present in clove essential oil that are known to kill viruses, bacteria and fungi include eugenol, thymol, carvacrol, and cinnamaldehyde. Add clove oil, along with other warming spices, and/or citrus, to your diffuser to cleanse the air of pathogens, prevent and heal sickness. This is another member of the “thieves” blend that is said to have helped gypsies ward off deadly illness during the time of the plague. Other key players in this germ-fighting combo include lemon essential oil, rosemary oil, cinnamon oil, and eucalyptus oil. Long before there were dental schools and Novacaine shots, clove oil was used in dental applications to ease toothache pain due to its analgesic properties. To see this in action for yourself, rub a drop of clove oil on your lips to feel the unusual, tingling and numbing sensation. This powerful essential oil is still used in dentist’s office’s today. In addition to being numbing, this oil attacks pathogens making it ideal for mitigating mouth infections and helping skin wounds to heal. If you’d like to deliver a burst of vitality to your home or office space while clearing the air of harmful pathogens and delivering immune-boosting benefits and even raising libido, then choose clove oil to add to your aromatherapy repertoire. If you love pumpkin pie, then you’ll appreciate this aromatherapy diffuser blend that contains all the secrets ingredients that make this traditional American Thanksgiving dessert so delicious. But instead of consuming the calories, you get to breathe your pie. Some say that pumpkin pie spice is an aphrodisiac. The science seems to support this, so diffuse this warming blend on an evening you want to heat things up in the bedroom. Crackling fire, cozy pumpkin spice… now that’s nice! Amazing, intoxicating vanilla is more than just a yummy addition to your homemade baked goods. Its health benefits go far beyond the pleasant olfactory sensation you get when wearing your favorite vanilla musk perfume. There’s a reason that the aroma and flavor of plants like vanilla appeal to our noses and taste buds. Vanilla has an incredible ability to heal and restore, and the natural essential oil of this plant is no exception. We can certainly make use of this gift when we sniff up delicious vanilla essential oil by way of our aromatherapy diffusers, naturally scented candles and other means of sensory enjoyment. Vanilla scored extremely high in scientific studies designed to measure its anti-oxidant properties. What this means is that it is a life-giving plant. Modern science has a word for the breakdown of all living things: oxidation. Every living thing oxidizes, but some substances which we consider harmful speed up the oxidation process. Others, known as anti-oxidants, have the opposite effect, and vanilla is officially classified as a powerful anti-cancer and free-radical fighter. Another indicator of life-giving properties of vanilla oil: it has been successfully used as a home remedy to raise libido levels. Vanilla oil works as an aphrodisiac by stimulating the endocrine system and increasing hormonal activity. Is it any coincidence that vanilla essential oil has become a popular ingredient in perfumes, which we spray on in the hope of attracting a mate? Vanilla oil can also be inhaled to help reduce inflammation. Inflammation is the body’s way of fighting back against a perceived threat. Our liver sends white blood cells to a specific area of the body, such as the stomach in the case of food allergies. For various reasons, including imbalance, overactive stress response and possible sluggish liver and/or kidneys, many people suffer from an overactive inflammatory response. Diffusing vanilla on a regular basis is one way to utilize its restorative properties to help return the body to a healthy state of balance and properly functioning immune system. What makes apple pie, apple dumplings and apple crisp so good? The aromatic, warming spices that put the finishing touch on these comforting fall desserts. Add this apple crisp diffuser blend recipe to your essential oils humidifier, and comfort your spirit with apple spices while taking in a deep sniff of healing, cleansing aromatherapy. TIP for fall: If you run a wood stove or have a fire at your home often in the colder months, then you know how dry the air can get. Even if you don’t have a fireplace or stove, you probably know the feeling of irritated nasal passages due to the dry, heated indoor air of autumn and winter. An essential oil humidifier and diffuser in one (like this one) can beat the dry heat while stimulating your senses and enlivening your spirit. Or try dripping a few drops of your favorite spice oils into a kettle that simmers atop your wood stove. Being able to breathe moist air that’s loaded with antioxidants will help you battle cold and flu germs this coming winter. Cinnamon may be best known for its role in delicious desserts… but did you know that this spice is a powerhouse of health benefits? If you like the smell of cinnamon and want to take advantage of its positive effects on your body and spirit, then put cinnamon essential oil into your aromatherapy rotation. A little goes a long way with this essential oil, so you only need a few drops to get the full healing benefits. Add cinnamon oil to your essential oil diffuser and enjoy the instant grounding effects that it has on the emotions. In the same way that peppermint cools, cinnamon is a warming spice, and that goes for the oil as well. The warming spices stimulate the body systems, which means increased mental activity, improved digestion, immune boosting, and more. Powerful cinnamon oil improves the digestive functions by ridding the body of candida, the strain of yeast that lives in our digestive tract and may get out of control with too many prescriptions for antibiotics, excess alcohol consumption, and a high-sugar, high-carbohydrate diet. This is due to its antifungal properties. Cinnamon is said to help the body process sugar. If you’re a diabetic, you might ask your naturopath if cinnamon aromatherapy along with a low-carb diet, can bring your blood sugar levels back into a healthy range while stimulating insulin production by the pancreas. Even if you do not have diabetes, it’s clear that more than just flavor is the reason for cinnamon being such a popular addition to favorite desserts like rice pudding, cookies, fruit pies and more. Linking the two benefits together, we know that people with diabetes are more prone to yeast related infections, including foot fungus, jock itch and thrush. So if cinnamon reduces sugar levels in the blood, is it possible that this is the reason why it also stops yeast infections from getting out of control? More amazing benefits of cinnamon: it’s antibacterial and antiseptic, making it a mainstay if you’re someone who diffuses essential oils to rid the air of your home or workspace of airborne pathogens. The popular “thieves blend” referenced above that was handed down from the time of the plague includes cinnamon essential oil as a key ingredient in staving off harmful and even deadly germs and bacteria. Baked apple desserts will always be a crowd pleaser, but what would this comforting treat be without the signature warm, spiciness of cinnamon, balanced with tangy lemon? Yes, cinnamon and lemon combine perfectly, not only in baked apple recipes, but also in your favorite aromatherapy diffuser blends. Humans have long recognized the healing power and invigorating properties of lemon essential oil. Derived from lemon peels, this amazing essential oil packs a punch when it comes to disinfecting and rejuvenating. Another oil that boasts the exceptional ability to fight cancer-causing free radicals, lemon oil is a favorite for adding to home cleaning products that disinfect and sanitize, and skincare recipes that cleanse, tighten, tone and repair the skin. In the same way that lemon oil works for surface cleansing applications, you can diffuse it through the air of your home or office to purify the air and oxygenate the airways and lungs. Lemon oil cleanses toxins from the body as it fights bacteria and boosts energy levels. The best thing about lemon oil is that it promotes clarity of thinking when inhaled. Lemon oil, like orange oil, is known to elevate mood and increase calm simultaneously. This results in a sharpening of the senses and increased alertness and feelings of well-being. Lemon oil mingles nicely with any of the stimulating and healing warming essential oils, such as cinnamon oil, ginger oil, clove oil and nutmeg oil. Basically, if you’d use it in a recipe for a baked dessert, then the same combination will be a treat for your nose, senses and all-over health. Here’s a health factoid that you may not know. If you love the flavor and aroma of nutmeg, your body may need a boost of magnesium and/or potassium. Respond to your inner cravings with this tantalizing nutmeg chai essential oils aromatherapy blend. The health benefits of this wonderful plant are truly amazing. It’s a wonder what the nose knows. Nutmeg essential oil works as a natural analgesic, which means it relieves pain. So if you’re feeling tired and achy, you can breathe in nutmeg-oil infused air particles by way of your aromatherapy diffuser. This will help your nerves settle so that aches and pains go away. Potassium-rich nutmeg oil also balances the blood pressure and dilates the blood vessels. This increases blood circulation so that your veins are able to pump blood more efficiently. When your blood pressure is balanced and cardio-vascular system works properly, your body is better able to recover quickly from sickness, heal faster after injuries, and keep the immune system at its best for fighting germs, viruses and bacteria. Nutmeg is naturally high in magnesium, which relaxes the nerves and helps them work in concert with the muscles so our bodies work better. Digestion is a great example of this. When your nerves are soothed and nourished, your body becomes primed to send signals to the muscles to pass food through the intestines and deliver nutrition to the blood while filtering out impurities. This also has to do with our “fight or flight” response to stress. Stress signals the sympathetic nervous system which means our nerves respond less to sleep and digestion, and more to sensory stimuli. The magnesium in nutmeg oil can help you regulate and balance your nervous system so that during true down-time, your body is better able to regulate itself without overactive nerves mucking up the works. Nutmeg also benefits the digestive system, which is related to the two prior mentioned health benefits of this amazing essential oil and plant. If the nerves are calm, the blood is pumping efficiently, and the body is at peak performance, then you are better able to digest your food without issue. Fast food, imbalanced diets, modern farming methods, and a high-stress lifestyle have all contributed to magnesium and other mineral deficiencies. People are beginning to recognize the impact this has on their health. Adding nutmeg oil to your diffuser blends can help the body absorb the missing minerals that it needs to function properly, and this definitely can have a positive effect on the way your body uses the food you eat. Stave off cold and flu germs while chasing the blues away this autumn and winter. Here’s an essential oils blend with incredible positive effects for both your body and mind. Ginger oil boasts disinfectant, antifungal, anti-inflammatory properties. It soothes the nervous system, clears the lungs, heals the throat and aids in digestion. Enjoy a cup of warm ginger tea with lemon while you diffuse this spicy essential oils blend. Did you know that ginger essential oil is known to many people as the “empowerment oil” for the confident feelings that it is said to induce upon inhalation? This magical plant has been used for centuries in cooking and medicinal purposes. Best known as a digestive aid, ginger root is a mainstay in many Asian and Indian recipes which contain meat or fish. Think of those little slices of pickled ginger served with your sushi meals at restaurants. Not only does ginger oil aid in digestion, but you can use it in a diffuser to alleviate nausea via inhalation. In addition, ginger oil can be used for pain-relieving purposes as it is analgesic in nature. If you’re experiencing a headache that you’d like to cure quickly without resorting to over-the-counter painkillers, try a natural remedy that do more than just go to the site of the pain; it will return your entire body to a balanced state. Do some slow, mindful yoga while deeply inhaling your favorite essential oil blend of ginger and other essential oils that lift the spirits and calm the mind as they heal and restore. Ginger oil, along with the other warming spices, cinnamon and nutmeg, has powerful healing properties, including being antifungal. If you’re thinking that you’d like to give your body a full cleanse to help improve digestion and absorption of the nutrients in your food, then make ginger oil a regular part of both your diet and your aromatherapy and skincare applications. If you choose to supplement with ginger oil, purchase the herb in pill or tincture form. 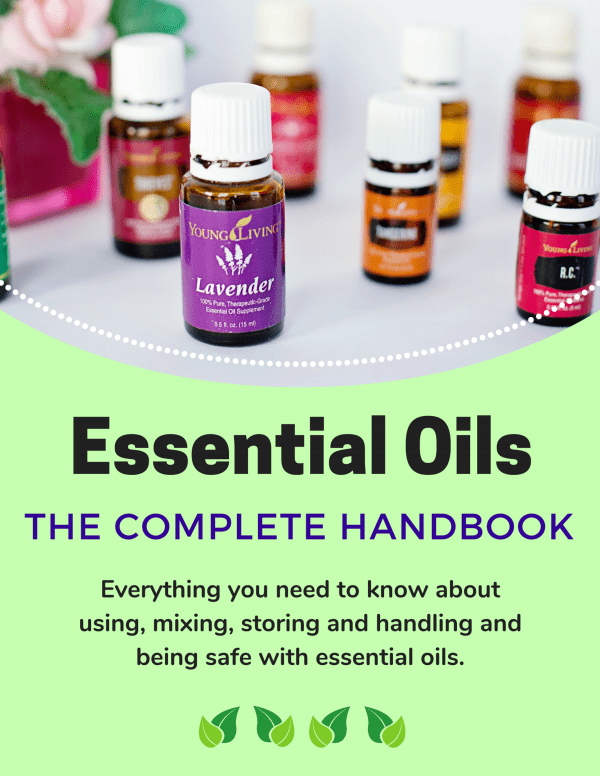 Essential oils that are used for aromatherapy purposes are not meant to be consumed. Another health benefit of ginger oil: it’s known to be anti-inflammatory. If you suffer from rheumatoid arthritis, allergies, digestive upsets or aching joints, consider diffusing ginger along with other, healing essential oils. You can also add ginger oil to your homemade skincare recipes. 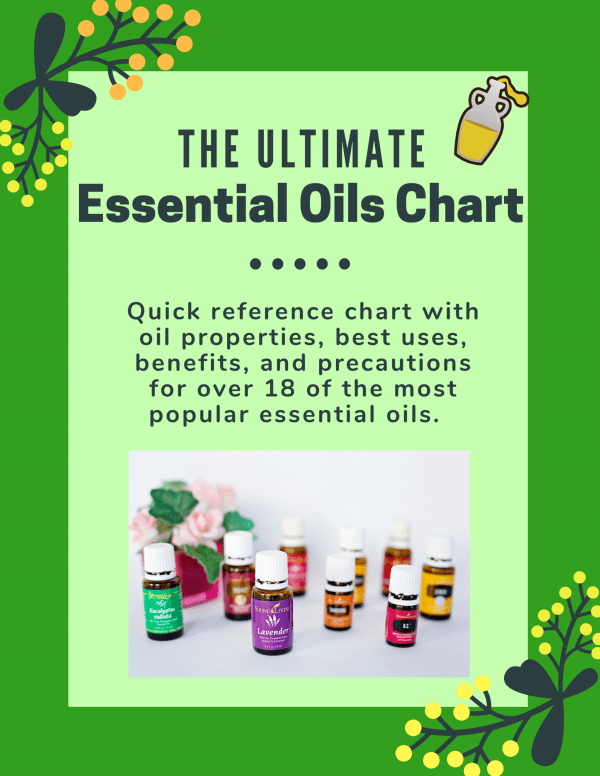 Just be sure to use this and other warming essential oils sparingly, as some can be caustic so check the labels or do a patch-test on your wrist before adding to your mixes.